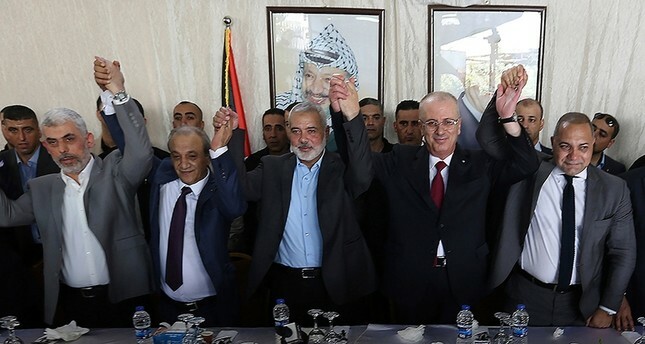 Hamas has announced it sealed a unity agreement with rival West Bank-based Fatah after two days of talks in Cairo. The Head of Gaza-based Islamist group Ismail Haniyeh said both parties reached a deal on the management of Gaza, which has been under the control of Hamas since 2007 after Fatah members were fought out in the wake of 2006 elections won by Hamas. 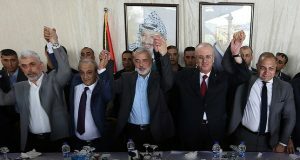 Haniyeh however noted that details of the deal will be announced during a press conference later on Thursday. Hamas under intense pressure from Egypt, United Arab Emirates and Saudi Arabia agreed to surrender the enclave Strip to Fatah of Mahmoud Abbas who heads the Palestinian Authority. The Islamist movement lost its traditional supporter Qatar after Doha found itself isolated by the Saudi-led quartet over its alleged endorsement for terrorism. Hamas has been cashless and squeezed in a dramatic humanitarian situation after Abbas refused to pay Israel Gaza’s energy bills and Hamas workers. Gaza, following Hamas’s takeover, has been under siege both by Israel and Egypt complicating life conditions of close to 2 million Palestinians. Palestinian Prime Minister Rami Hamdallah made a historical visit to Gaza last week. The visit was the first since 2014 following the fall of the unity government. The reconciliation will be crystal clear with both sides reaching agreement on the security control of Gaza and the fate of the thousands of workers who are on Hamas’s payroll. Abbas last week warned that the Palestinian Authority will not accept any copy of Hezbollah of Lebanon in Palestine, referring to Hamas military power in Gaza.